This delicate, small clock is part of a line of functional tabletop items created by the House of Carl Fabergé. 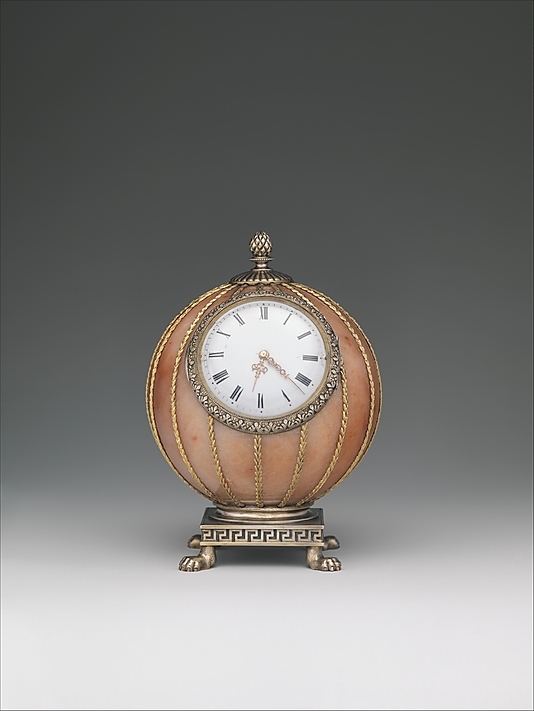 This clock in particular was made from a single block of rose jasper to ensure the color and grain of the hardstone would match perfectly and produce the best-looking piece (Keefe, 2008). It is adorned with embellishments in silver, silver gilt, gold, enamel, and glass. The shape of the clock was inspired by the late 18th-century and early 19th-century fad of hot-air ballooning. At this time, Fabergé made larger clocks with a similar spherical shape, and then produced this tabletop version (Keefe, 2003). 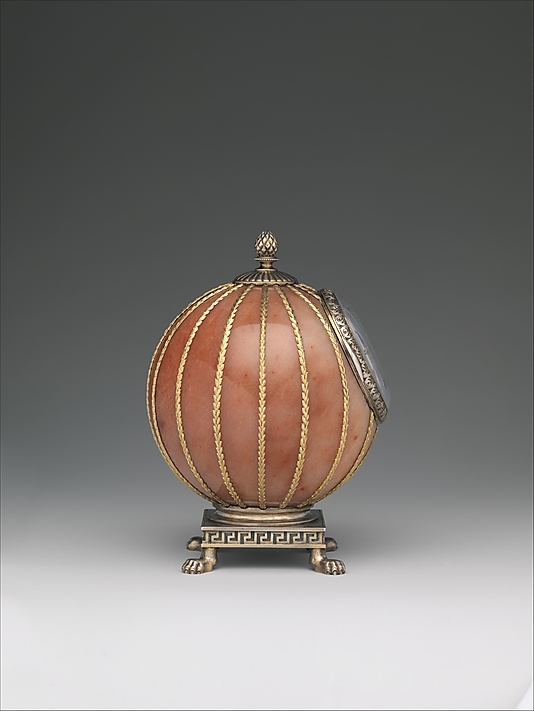 Though the piece is quite small, the metallic accents—the swirl of leaves around the face of the clock, the thin bands of laurel that separate the rose jasper egg into 16 even sections, the silver platform with Greek-inspired design, the claw-shaped feet, and the silver rosette and pineapple finial on top—make for an elegant piece with a presence larger than its dimensions (Matilda Geddings Gray Collection, 1972; Keefe, 2008). The white enamel clock face is a crisp accent against the deep pink hue of the jasper, as well as the metallic decoration. The globe-shaped clock is one object in a substantial collection of Fabergé items assembled by collector Matilda Geddings Gray. Gray, who lived in Lousiana, was one of the most well-known American collectors of Fabergé items. Gray first encountered the work of Fabergé at Armand and Victor Hammer’s display while attending the 1933 Century of Progress exhibition in Chicago (Keefe in von Habsburg, 1996). Gray was fascinated by the history of the Romanov dynasty and drawn to the Fabergé aesthetic (Keefe, von Habsburg, 1996). Gray was exposed to art and décor while attending the women’s division of Tulane University. Gray’s interest in collecting and background in art led her to assemble what Malcom S. Forbes (a prolific Fabergé collector in later years) called “one of the most sumptuous and beautifully chosen collections of Fabergé in the United States” (Keefe in von Habsburg, 1996: 69). In addition to the spherical clock, Gray focused her collection on floral pieces and other tabletop items. This clock was crafted in St. Petersburg, Russia by workmaster Mikhail Evlampievich Perkhin. Perkhin is credited with fashioning a number of Fabergé clocks over the years. The spherical clock is currently on long-term loan at the Metropolitan Museum of Art. It is owned by the Matilda Geddings Gray Collection of Louisiana. It has been exhibited at the New Orleans Museum of Art thrice, in 1972, 1992–1993, and 1996–1997. Dennis, J. M. (1965). Fabergé’s Objects of Fantasy. The Metropolitan Museum of Art Bulletin, 23(7), 229–242. Keefe, J. W. (2008). Masterworks of Fabergé: the Matilda Geddings Gray Foundation Collection. Nashville, TN: Cheekwood Botanical Garden and Museum of Art. This collection catalogue provided more background information about the Matilda Geddings Gray collection. This helped me to better understand why she may have chosen the spherical clock and how it fit in with the other Fabergé items in the collection. It seems, based on this book, that the collection focused on floral pieces and functional tabletop items. Lowes, W., & McCanless, C. L. (2001). Fabergé Eggs: A Retrospective Encyclopedia (pp. 226–227). Lanham, Maryland: The Scarecrow Press, Inc.
McCanless, C. L. (1994). Fabergé and His Works: An Annotated Bibliography of the First Century of His Art (p. 408). Metuchen, New Jersey: The Scarecrow Press, Inc. This is an exhaustive bibliography of sources about Fabergé! The notations are quite helpful, though the best part about finding this book was discovering this author. Christel Ludewig McCanless currently operates the Fabergé Research Site and responded to my email about the spherical clock on loan to the Met. Without McCanless’ help, it would have taken much longer to connect the dots on where this clock fits into the extensive catalogue of Fabergé eggs. McLaughlin, M. C. (2007). Fabergé Travels to Tennessee. JCK Online, 1–3. Sotheby’s. (1962). A Fabergé Spherical Clock. London: Sotheby’s. The Matilda Geddings Gray Foundation. (1972). Treasures by Peter Carl Faberge and other master jewellers. New Orleans: The Matilda Geddings Gray Foundation. von Habsburg, G. (1996). Fabergé in America (pp. 69–91). San Francisco, CA: Thames and Hudson, Fine Arts Museums of San Francisco. This source helped give context to the Fabergé spherical clock in this exhibition catalogue, as well as to the entire set of Fabergé items currently on long-term loan to the Met. Though it is well known that Russian and British aristocracy and royalty owned many Fabergé items, American ownership is lesser known. The Matilda Geddings Gray collection is one of the more extensive collections belonging to an American collector, and it is interesting to consider the pieces within it, especially since many of them are functional art objects, like this clock. Von Solodkoff, A. (1986). Fabergé clocks (p. 44). London: Ermitage Ltd.